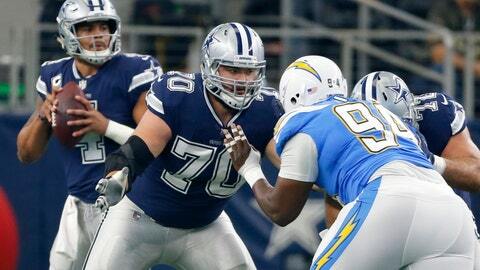 FRISCO, Texas (AP) — Zack Martin can’t pinpoint why the Dallas offensive line was better in consecutive road wins after a mostly rugged first half of the season. The Cowboys right guard has a few options: time to adjust to the season-long absence of fellow Pro Bowler Travis Frederick, a steady showing from Xavier Su’a-Filo at left guard for injured rookie Connor Williams or the position coaching change to former Dallas lineman Marc Colombo. Dak Prescott would suggest picking any of them. The quarterback doesn’t really care. The Cowboys (5-5) can pull even with Washington (6-4) atop the NFC East by beating their division rival on Thanksgiving. The surge into contention came from the pair of road wins against the past two NFC participants in the Super Bowl: Philadelphia and Atlanta. Those victories followed an 0-4 start on the road, with communication along the front among the primary problems without Frederick, the center and traffic cop who is out and increasingly unlikely to play this year because of a nerve disorder . Dallas has praised backup center Joe Looney , while Martin has played through a left knee injury sustained in a preseason game and aggravated early in the win over the Eagles. Who knows whether the 2014 All-Pro would be doing that if Frederick were still alongside him. Sacks of Prescott that were an issue in the four straight road losses haven’t disappeared. He’s been dropped 34 times this season, already a career high, with multiple sacks in eight straight games. That’s not even including a season-high six in the opener, a 16-8 loss at Carolina. But Prescott wasn’t sacked in the fourth quarter of the wins over the Eagles and Falcons, when the Cowboys matched tying scores with winning drives that featured a solid mix of star running back Ezekiel Elliott and clutch plays in the passing game. Time to throw for Prescott was crucial in several of those plays. It was trending in the wrong direction the first time the Cowboys played the Redskins . Elliott rushed for 33 yards, the second-lowest total of his career, and the Cowboys lost 20-17 when Brett Maher’s potential tying field goal from 52 yards hit the left upright on the final play. After that loss, the Cowboys replaced first-year offensive line coach Paul Alexander with Colombo, the assistant line coach who played tackle for the Cowboys from 2005-10. And now, Elliott is coming off consecutive 100-yard games and needs 91 yards to overtake MVP contender Todd Gurley of the Los Angeles Rams for the NFL rushing lead. Gurley is off this week. The Cowboys signed Su’a-Filo, a 2014 second-round pick by Houston, for depth in the second week of the season. A starter in 31 of 32 games over his final two seasons with the Texans, Su’a-Filo sat until Williams’ knee injury was diagnosed after a loss to Tennessee eight weeks later. Williams, who was overpowered several times on sacks of Prescott, is on the verge of returning after arthroscopic surgery. There’s no indication Su’a-Filo is headed back to the bench after his showing against the Eagles and Falcons. Five-time Pro Bowl left tackle Tyron Smith left the Atlanta game with what he described as a stinger, replaced by former New England tackle Cameron Fleming, one of Dallas’ free agent pickups. Owner and general manager Jerry Jones said Smith should play against the Redskins. NOTES: Jones said on his radio show Tuesday he expects TE Geoff Swaim to miss three to four weeks after surgery for a broken wrist. … Rookie WR Michael Gallup remained away from the team after getting the news following the Atlanta game that his brother had died by suicide. There is still a chance Gallup will play against the Redskins. … C Adam Redmond was added to the injury report Tuesday with a concussion. He didn’t practice.